This holiday season, I’ve channeled Coco Chanel’s philosophy for my holiday décor. When it comes to decorating for the season, my basement is host to boxes upon boxes of Christmas decorations that keep 5 Christmas trees of various sizes and colours company. It’s no surprise that my husband stresses every year starting around the end of October when he knows what lies ahead. For me, it isn’t enough to just pull everything out of storage to create holiday magic; it also means ALL boxes must go back until the season is over. For my husband, this is not a ‘magical’ start to the season. This is no simple task as over the years, I have acquired and accumulated a variety of beautiful ornaments however each new season brings a new colour scheme that I just have to add to my collection. The good thing about having a collection this large is that it’s easy to sneak the new stuff in past my husband who can’t keep track of it. This year I want to bring in a new year’s resolution a little early and apply ‘less is best because it’s the little things that count’ to my holiday décor. As Coco Chanel once said, “Be classy. Anything but trashy.” This is a great rule of thumb to apply to this year’s holiday décor. So now that I’ve made my decorating resolution, how can I apply it? I’m sharing a few highlights of my 2013 Christmas décor plans that you may want to consider for your own décor plans. Start by establishing the overall colour scheme in your home. Treat this as the your starting point – just like a simple black dress. Once you have determined your colour you can begin to build on it to create holiday sparkle. It’s just like adding jewelry to your little black dress. Help to bring a natural feel to your décor by bringing in natural elements such as sculptural boxwoods with lush glossy leaves and rich colour. Talk about festive! This beautiful greenery goes a long way towards enhancing the holiday and winter season and can act as seasonal décor – not just for the holidays. Make sure you pick up faux boxwood meant to last so you can use it for seasons to come. Place in white vases or wrapped in burlap. It’s a gorgeous touch to fireplace mantles or anywhere else in your home that needs some holiday magic. Pick up some natural wood lanterns, which look wonderful next to the boxwood. I suggest groups of 3 in different sizes or shapes so they look natural and not ‘staged’. Use your stairs as a focal point. Wrap or tack boxwood or other greenery along the banister. 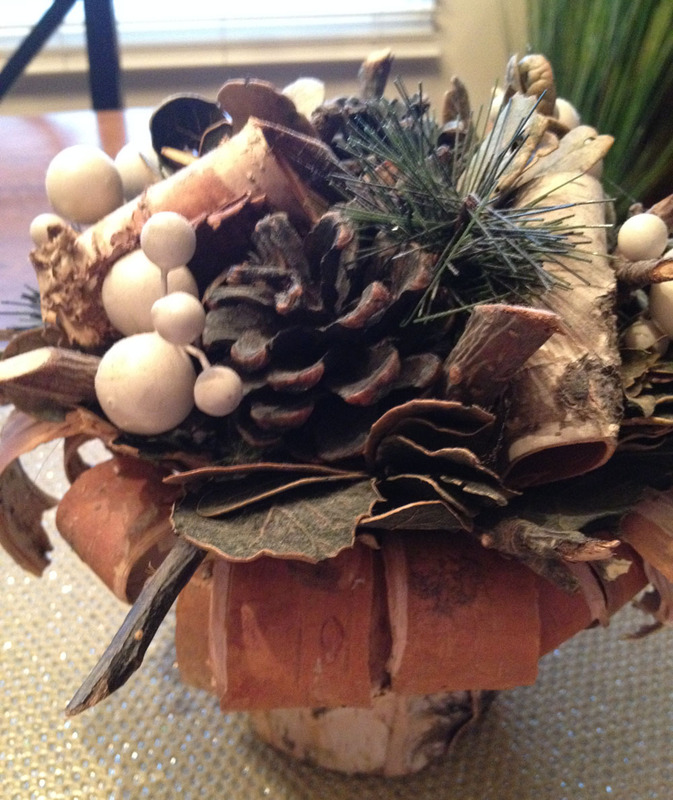 Secure with florist wire, and then add some clusters of pinecones. That’s it! White Pine. Buy faux for inside the house, otherwise they will dry out unless watered. White pine needles are long and soft, however they cay look thin in a container so try adding more to create a fuller look. Cedar needles grow in long fronds that hang nicely over the edge of a pot, or tied together in a swag or garland. Blue Spruce is known for its stiff branches and sharp needles. The spruce is ideal for hanging ornaments and making decorative wreathes. It usually has a hint of blue grey hues so it is a natural compliment to the greenery in your arrangement. Juniper is a hardy shrub which often contains beautiful blue berries and a nice contrasting texture to holiday arrangements. Definitely buy faux for inside, because it dries out very quickly. Don’t forget the doors inside your home! You can add some holiday sparkle with a boxwood wreath. A simple wreath can be beautiful with decorative, coloured ribbon and no ornaments. Remember, ‘less is more’. The bright green of the boxwood looks especially brilliant and fresh against a white door. Try playing with natural accessories that you find out in nature or in your favourite store. You can use nature’s own decorations such as pinecones and berries, birch branches, curly willow sticks to name a few. After you have established your homes base colours established in beautiful greenery, birch branches, sticks and natural elements you can begin adding a hint of Christmas colour of your choice. So just like that little black dress which, in this case is your wall colours, you can start to dazzle up your look with some colour. This can be added with simple throw cushions, tree ornaments or other small splashes of colours throughout your home. Remember –keep it simple. After Christmas has come and gone, make sure to put away the Christmas tree and any colourful ornaments that are specific to Christmas. All your natural and simple winter greenery items can stay put through the winter months and keep your house looking festive for the season and not just the ‘holidays’. Your husband will thank you. These ideas don’t belong specifically to the inside of your home. Try bringing your colours and decorative ideas to the outside as well so your guests and neighbours can enjoy your seasonal spirit. As Coco Chanel said, “Elegance comes from being beautiful inside as outside.” I believe Coco’s advice can be applied to so much more than fashion and it’s a wonderful philosophy for your holiday décor. The holiday season is a magical time so let your imagination help you to create a festive and warm feel inside and out because as Coco Chanel knew, it’s the small things that count. From me to you – have a wonderful Christmas and a very festive and happy new year!